As more persons become aware of Rosslyn's beauty, traffic into Rosslyn is building up. This morning inhuman-powered vehicles lined up to enter Rosslyn from Rt. 50 from both directions and from N. Meade St. 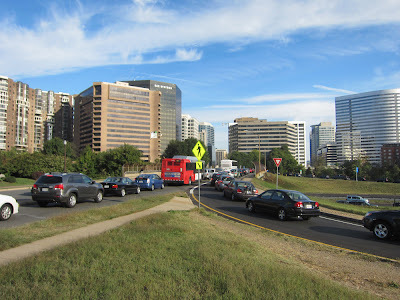 Given that Rosslyn is a hub for multi-user paths, walking, running, biking or skating can help you get into Rosslyn quickly.